I had bike fixed up in time for Frocks on Bikes on Saturday. I'm not sure how well I did on fitting the tyres and tubes though, as the air didn't stay in them as long as I would have liked. 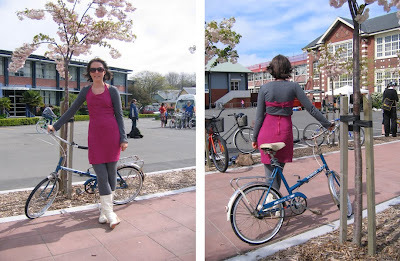 I cycled through town in my pink dress, feeling a little self conscious. That's until Briar arrived on her tandem bicycle adorned with ribbons! 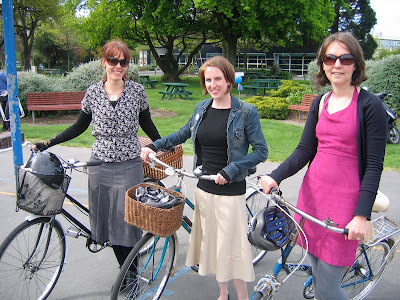 Mel and Lucy (of Black Swan and Felt fame) were also there with their bicyles. Mel even had a wee portable stall setup on the back of her bike. I'm already scheming how I might be able to replicate that on mine... Unfortunately Briar left before I got the chance to photograph her and her daughter on their tandem bike. There were lots of bikes on display, including this very pretty Pashley Princess which I took for a wee test ride. Earlier in the week I hadn't chosen which dress to wear. Then I remembered a conversation I'd had with Ninotchka of The Wardrobe at the last Crafty Business. While regaling her with stories of my sewing skills, I mentioned that once, a long time ago, I had made a dress without a pattern one evening. I had only worn it that night, and didn't go out until it was finished. Which ended up being about 2am. The design revolved around the length of zip I was able to acquire on a Saturday evening. I searched for a supermarket with a decent haberdashery section, and eventually found one at Woolworths. So she challenged me to find the dress, see if it still fitted, and put a picture of myself wearing it on my blog. 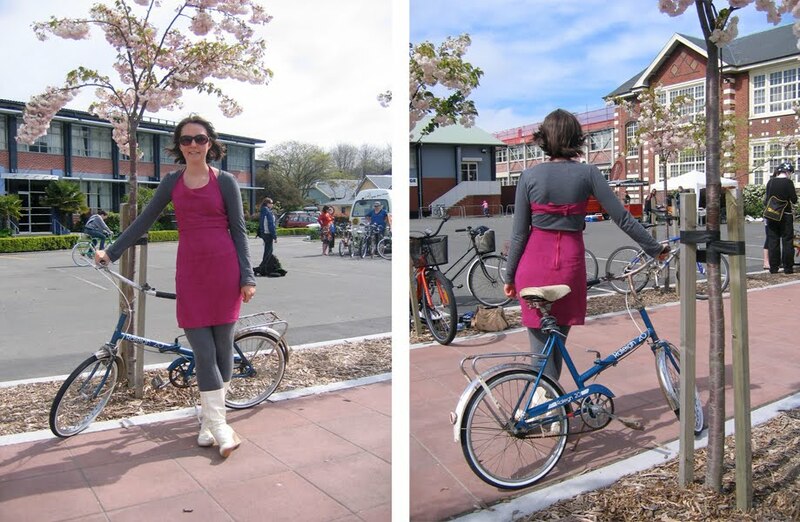 I thought I would kill two birds with one stone and wear it to Frocks on Bikes. It isn't the most practical style to bike in, so the leggings were a much needed addition to the outfit. As it wasn't that warm, I added a long sleeved top to the mix as well, so I was secretly a little bit glad it wasn't really hot day. Here are the pictures to prove it, showing front and back! 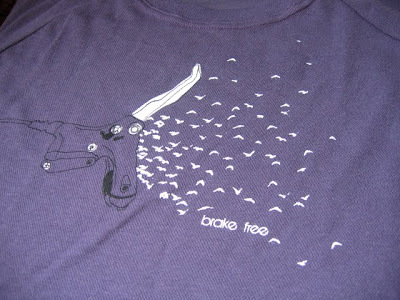 My winning streak also continued, and I won myself this sweet t-shirt as well. Maybe I should get myself a lotto ticket? Fantastic! You rose to the challenge (oh dear, excuse the really bad pun). It fits you really well - especially considering you draped it on yourself in the space of an evening - perhaps you should try for the next season of Project Runway? 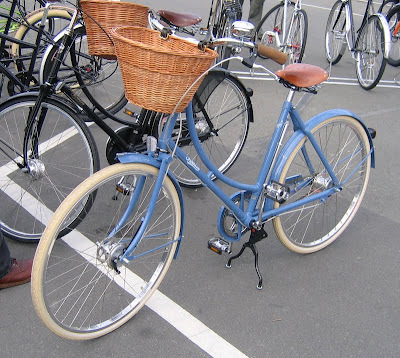 Love the photo of the Pashley Princess ... I had a bike very similar to that when I was 10 I think with white tyres ... 10 bucks at a garage sale and I rode it EVERYWHERE!!! Thanks Nin. It fitted a lot better when I made it, it was a tight squeeze on Saturday! It sat a little higher than in should, but I was stoked I could still fit into it!